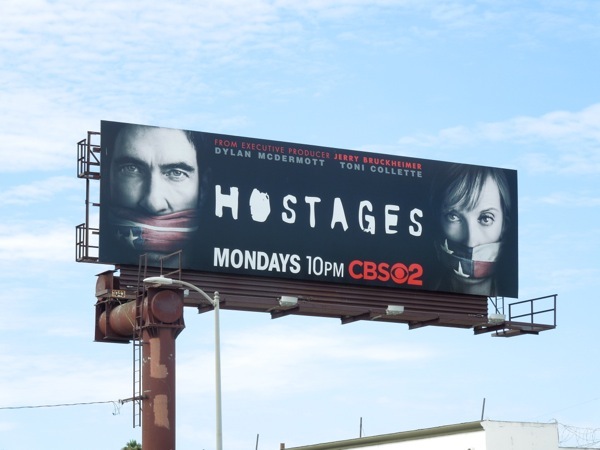 Well can you believe it, here's a new TV show that isn't a remake, spin-off or copycat and Hostages also has a really compelling ad creative to boot. The new high-stakes suspenseful drama from CBS also has some major star power to attract viewers in the form of Emmy and Golden Globe Award winner Toni Collette (for her multiple roles in United States of Tara, although probably best remembered for her breakout movie role in 1994's Muriel's Wedding) and fellow Golden Globe winner Dylan McDermott who's recently be surprising and disturbing audiences in two seasons of American Horror Story. He plays a rogue FBI Agent 'Duncan Carlisle' who takes Collette's surgeon 'Dr. Ellen Sanders' family hostage and threatens to kill them all if she doesn't assassinate the U.S. President when she operates on him. The series really does sound intriguing and Daily Billboard is sure it would make for a great movie or mini-series, but is this a flawed show? What kind of longevity can it have, can the central premise of this series stretch beyond one season? Will her family be held hostage and then escape, and then be recaptured time and again? 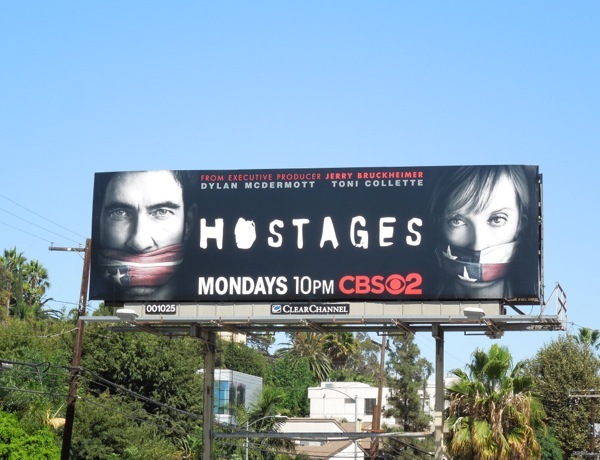 These billboards for the new thriller with the clever American flag gags, were first spied at La Brea Avenue and Sunset Boulevard on August 22, plus later at the busy intersection of Venice Boulevard and La Cienega Boulevard on August 31 and also along Highland Avenue on September 4, 2013. 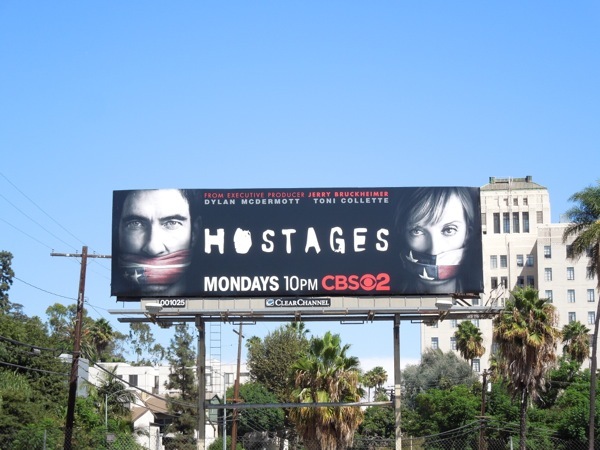 Only time will tell whether Hostages will be able to keep audiences riveted in their seats each week, or whether we'll want to pay a small ransom to make it go away.